Darwin explained the creation of coral atolls in the South Pacific (1842) based upon observations made during a five-year voyage aboard the HMS Beagle (1831–1836). His explanation, which is accepted as basically correct, involved considering that several tropical island types—from high volcanic island, through barrier reef island, to atoll—represented a sequence of gradual subsidence of what started as an oceanic volcano. He reasoned that a fringing coral reef surrounding a volcanic island in the tropical sea will grow upwards as the island subsides (sinks), becoming an "almost atoll" (barrier reef island) (as typified by an island such as Aitutaki, Bora Bora and others in the Society Islands). The fringing reef becomes a barrier reef for the reason that the outer part of the reef maintains itself near sea level through biotic growth, while the inner part of the reef falls behind, becoming a lagoon because conditions are less favorable for the corals and calcareous algae responsible for most reef growth. In time, subsidence carries the old volcano below the ocean surface, but the barrier reef remains. At this point, the island has become an atoll. 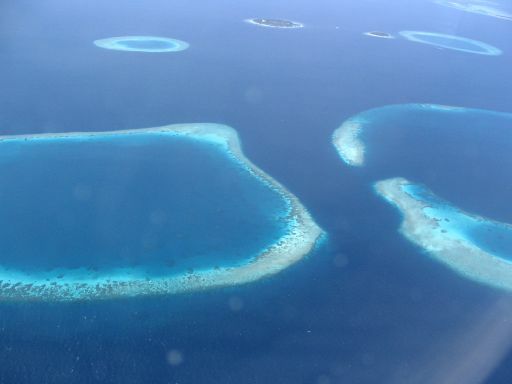 Atolls are the product of the growth of tropical marine organisms, so these islands are only found in warm tropical waters. Volcanic islands located beyond the warm water temperature requirements of reef building (hermatypic) organisms become seamounts as they subside and are eroded away at the surface. An island that is located where the ocean water temperatures are just sufficiently warm for upward reef growth to keep pace with the rate of subsidence is said to be at the Darwin Point. Islands more polar evolve towards seamounts or guyots; islands more equatorial evolve towards atolls (see Kure Atoll). 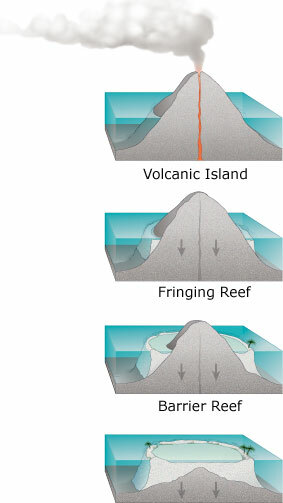 Reginald Aldworth Daly offered a somewhat different explanation for atoll formation: islands worn away by erosion (ocean waves and streams) during the last glacial stand of the sea of some 900 feet (270 m) below present sea level, developed as coral islands (atolls) (or barrier reefs on a platform surrounding a volcanic island not completely worn away) as sea level gradually rose from melting of the glaciers. 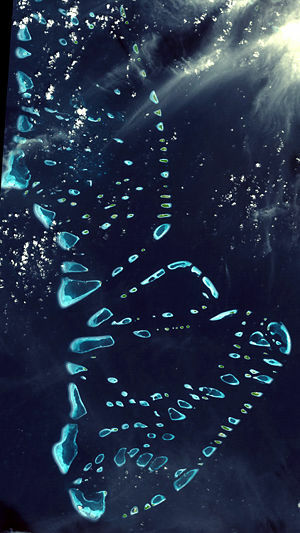 Discovery of the great depth of the volcanic remnant beneath many atolls (see Midway Atoll), favors the Darwin explanation, although there can be little doubt that fluctuating sea level has had considerable influence on atoll and other reefs. You can find more infromation here , here and here on wikipedia. Describe in your own words: What is a "Thila"
Describe in your own words: What is a "Giri"
Describe in your own words: What is a "Faru"
Note: You do not need to wait for log permission. In case there is a problem with your answers I'll contact you. If no answers are sent, the log will be deleted without further notification.